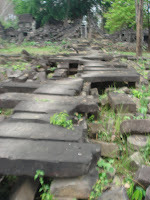 The stone path leading to Prasat Prear Khan. Prasat Preah Khan is a remote temple complex located about 200 Km from Siem Reap on route 66. It was very difficult to get there having to negociate deep sand, single track and unmarked route. It was a long day. I opened your blog and saw the pictures. It is nice,but you look tired and got old. I relived after I saw your pictures. I visited Mieko san last night with Kenzou and Dad. I am looking for a adoption dog. But I can not find a dog myself so Mieko San is helping me to find dog. All my family is same,that meaning is good. Please you take care drive by motorcycle and everything. I hope You enjoy the traveling.